FORMER MODEL HOMElocated in Conservatory Green at Stapleton--home made for the city soul & prairie heart! 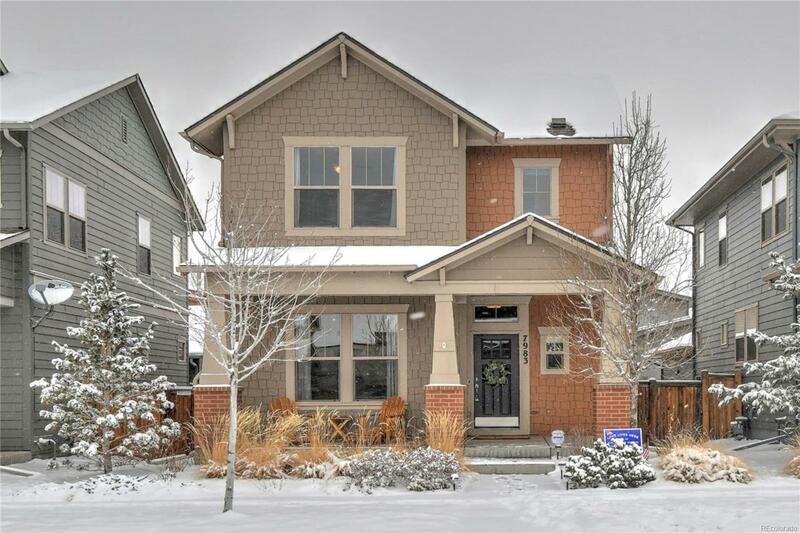 This sought after 2-story David Weekley home offers a gorgeous craftsman curb appeal with a covered front porch, 4 bedrooms PLUS a study and 4 bathrooms. The bright & open floor plan provides a welcoming entrance, beautiful study, powder bath, and great room with custom stacked stone fireplace, open to the gourmet kitchen with 42 inch upgraded cabinets, stainless appliances, large dine-in granite island open to the dining area and glass door leading to your gorgeous backyard with a large patio and 2-car attached HEATED garage. The second level offers a master bedroom with walk-in closet, tiled bath with double vanity and huge shower, an upper-level laundry room, two bedrooms and full bathroom. The finished basement offers a rec/media room, guest bedroom, bathroom and tons of storage. This lovely home also features 10 ft ceilings, wood floors, crown molding and so much more!